SCVHistory.com LW2994 | Film-Arts | Movie Herald: 'Isle of Lost Men' (Trem Carr 1928). From India. Movie herald (advertising flier) for the Trem Carr Production of "Isle of Lost Men," released Oct. 1, 1928, by W. Ray Johnston's Rayart Pictures Corp. This herald advertises the opening of the film on June 22 (probably 1929) at the Alexandra Cinema on Bellasis Road, Byculla, a suburb of Mumbai (then called Bombay) on the west coast of India. 4 pages, spot color, approx. 4½x6½ inches. Interior pages (the blue page) is a double-truck. Printed in the USA by Filmack Co. of Chicago. According to the herald, the story (by George W. Pyper and Frederick Nebel) pertains to a lost sailor who is rescued by a white girl who had been kidnapped as a child and raised in the Malay culture. Then, "what follows will make your every nerve tingle with excitment." 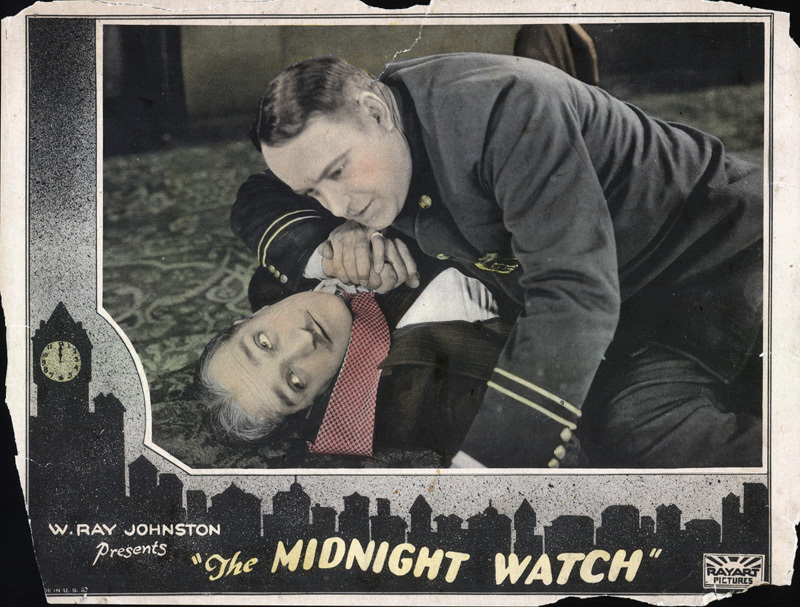 Which is a shame, because more than half of all silent films are lost forever — either the theaters didn't return the prints to the studio, or the studio's film vault burned, or myriad other reasons — and this is probably one of those lost films. Thus, we haven't seen it, so we can't know whether it was filmed in the Santa Clarita Valley. But Carr and Johnston made a lot of movies in the Newhall area in 1927-28-29. In 1931, Carr built a movie studio on property he leased in Placerita Canyon; Johnston was in partnership with Carr and even lived in a house that Charley Mack built on 8th Street in Newhall for a time in the 1940s. LW2994: 9600 dpi jpegs from herald purchased 2017 by Leon Worden from a dealer in India. Download original images here.